This is in no way a food blog, nor has it ever been. But chocolate chip cookies are showing up everywhere I look lately. See: here and here, and here, too. And after I dropped a hint last month that other health issues were plaguing me, I received a slew of phone calls, texts, and emails asking if I was okay. You guys are the greatest. I think I'm okay. Let me explain. I've always liked to cook, liked the process of combining ingredients into something greater than their parts. I might not be any good at chemistry, but I can bake, dammit. And I'd always prided myself on making a decent chocolate chip cookie--until I met Chris, that is. Chris' grandmother had been famous for her cookies. At Christmas, she didn't just make a few varieties and leave it at that, the way the rest of us mortals do. Instead, as the story goes, she would bake for days, making seventeen different varieties of cookies to share for the holidays. In the neighborhood where Chris grew up, her cookie plates were a highlight of the season. He told me the key was to refrigerate them overnight, and I scoffed at the idea. Who plans ahead for cookies? They'd always been a thing I'd decided on last-minute, when I had a hankering. That was the beauty of chocolate chip, I thought. It was a cookie that could come together in an hour, tops, when you had a craving for one. But then I stumbled across this recipe (I'm telling you, everyone else on the Internet is craving chocolate chip cookies, too). So I gave it a whirl. Lo and behold, the cookies were heavenly--chewy, full of toffee flavor, and with the addition of a sprinkle of sea salt on top I may have even tied the score with Grandma. It only took nine years. I can't blame the lousy winter weather on why I'm craving cookies. I don't have much of a sweet tooth. I'm certainly not pregnant (although they tested, just in case). And I'd be freaking out so much more if I hadn't just had a clean scan. There may be one other explanation: PMS. I have essentially been on my period since mid-December. (TMI? Maybe...) That's two months, folks. While I am so very happy that chemo hasn't put me in permanent menopause, I am really tired of ruining pants, doctors appointments with no answers, not to mention cramping and crankiness and headaches and bloating. So far, the bleeding hasn't made me anemic. Which is great, since it means I can still get chemo. Luckily, we were able to get things under control with a ten-day course of progesterone that my oncologist approved (I was shocked). And yet, my uterus is still shedding. I have my third meeting since Christmas with my gynecologist this week, to try to come up with a solution that my oncologist will be on board with. The go-to choice for regulating periods, birth-control pills, is not an option for me because of the hormones. Another possibility would be a hysterectomy, although I really don't want to lose another body part to this disease. I'm hoping we can find some middle-ground. In the meantime, I'm going in for more cookies. I don't know why, but they help. Not a bad idea at all. Soup and potato chips are at the top of my list. 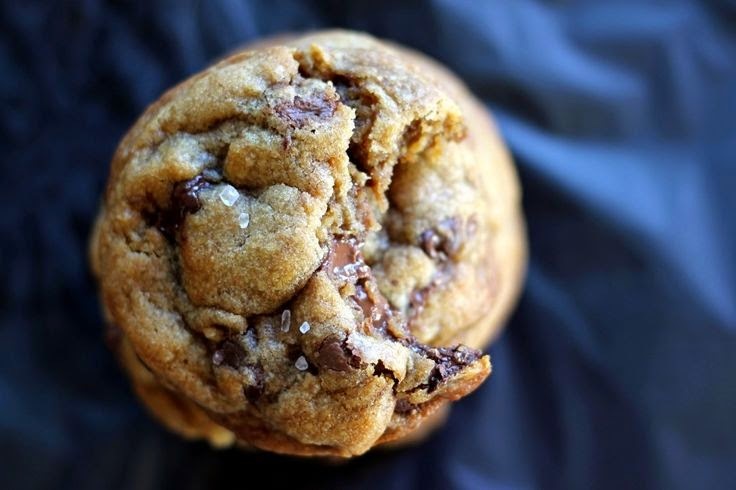 oh, my mouth is watering - if ONLY I could reach through the screen and devour that cookie! thanks so much for sharing the recipe- it will be a fun thing to do ahead of time when my grandkids are coming to visit, then they can help me put them on the cookie sheet (with little nibbles of the cookie dough, of course!) . I know there will be a lot of ooooohing and ahhhhhing - YUM, can't wait! on a more sober side, with your period since mid-December - is your onc a hematologist? if, not, perhaps calling one into your medical team may lead to answers. I will be thinking of you - keep us posted.